I have come to the conclusion that you are deliberately misleading the plant-buying public for your own profit by selling plants while not fully disclosing the plant’s specific needs and growing conditions. I first became suspicious of your tactic years ago, when I purchased a beautiful climbing vine that was covered with deep pink trumpet flowers. The plastic tag said Mandevilla, and when I asked the salesperson if this can grow on Long Island, he said yes. Although I was suspicious, it wasn’t a complete lie. This tropical beauty did grow on Long Island — until the first frost. Then, it was kaput. 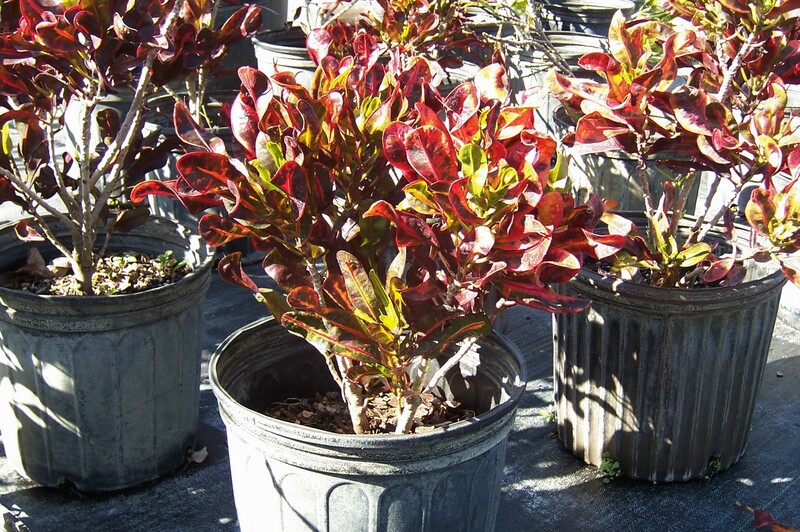 Imagine my surprise this year, when I saw countless Zone 6 and 7 shoppers picking up pots of Croton, pictured above. I had only seen the plant in South Florida — because it is native to the tropics. Actually, it’s one of my favorite plants in South Florida — the leaves come in a variety of shapes, from flat to crinkly, wide to elongated, and the colors are brilliant hues of greens and reds and golds. With autumnal colors like that, it’s no wonder that so many northern gardeners stocked up on the plant, punching up their fall flower displays. What saddens me in all this is the amount of money that homeowners shelled out for a plant that really would only last until the first frost — which, in this area, could happen a day or a week after purchase. There’s no guarantee when frost will arrive, just know that it will — and when it does, your tropical treat will be a droopy disaster. Equally frustrating is the amount of money the garden centers pull in by selling tropical plants at the end of the growing season. I really cannot blame the gardening public. For starters, they may not have any knowledge of the plant. It’s the garden centers, though, which not only count on the consumers’ impulses but also have their expert salesperson guide the novice gardener into making the purchase. That’s a lot of brown matter, as well as green matter — financial and organic. It’s also a waste. And it’s irresponsible. And it teeters awfully close to being a scam. But, hey, that’s business. Right? From now on, I will speak up when I see a shopper wasting his or her money on a plant that has no chance of surviving because of the climate. The buyer and the gardener should certainly be aware, but so should the home and garden center — we gardeners know your game and we know how to plant seeds. I had a similar wasteful trip to a garden center here in Zone 7 several years ago. I found several beautiful hibiscus shrubs that I believed would survive our winters. We planted them, along with a “Rose of Sharon”, which is in the same family, I believe. Needless to say, the “Rose of Sharon” is still alive and beautiful, years later, giving me wonderful blooms every summer, but the others died before the following spring. I was very disappointed and aggravated because of the money that was wasted. The plants were not cheap and I really wish that, since they were not hardy in this area, they wouldn’t have even been offered for sale! Shame on you, garden centers, for trying (and succeeding) to scam those of us not knowledgable enough about what we are planting. I have learned a very valuable (albeit expensive) lesson. Thanks for sharing your thoughts with us! Keep on blogging! I think there are many, many people out there who have been mislead and misguided into purchasing plants for the sake of profit — with little regard for the consumer’s wallet and the plant. And once the plant dies, most people just figure they’re out of luck and chalk it up to a loss. Hold onto the receipt and try for a return. I understand exactly what you are talking about, it’s one of the reasons I so rarely go to a garden centre! But I wonder if people should start naming and shaming? Or maybe it’s just best to stick with your plan and talk to fellow shoppers and gardeners. Naming and shaming is one tactic — but maybe knowledge is power, and through education, we can help others be better gardeners. Funny, your mention of crotons. I have a couple in my garden here in Rwanda that I need to remove, not because they’ve died, but because they’ve done too well. They are quite tall, so when you look at them, all you see are the not very pretty stems and undersides of the leaves. Crotons need to be looked down upon, I think. Getting a plant to survive is often only the beginning of a gardener’s worries. I once saw some gardenias for sale when I lived farther north. I asked someone “These aren’t hardy up here, are they?” “No”, was the answer “but the southerners don’t know that. We sell of out them ever year!” I never went back to that garden center! Now, that is criminal! Good for you for taking a stand! That does reek of a scam! They should clearly mark the plants – if that happened here in SA, there would be an outcry and the garden centre would be in for some serious flack! It was strange to see so many people buying these plants. Maybe they weren’t aware. Maybe they never read the labels. Maybe they really didn’t care about the money they were wasting just for the sake of having full fall colors. It all seems so wasteful. Hello and thank you for the support. I hope someone listens. Hello NGDM I have never been to your blog before – interesting and heartfelt comment. As a designer I have become pretty fed up with the vast amounts of money that can be thrown at a garden. Moving far from the holistic pursuit of gardening. The garden centres have much to answer for. Catharine, I’m so glad you found me! It seems as if this post has opened up a can of worms. Many people either experienced for themselves or know someone who was lead down the wrong gardening path. The garden centers of the world need to do a better job of advising the public and teaching them the basics. Bridget, thank you for your support! Frances, nice to hear from you. Apparently, this is an international issue — which somehow comforts me to know that this is not strictly an American concern. Together, we can create global change.